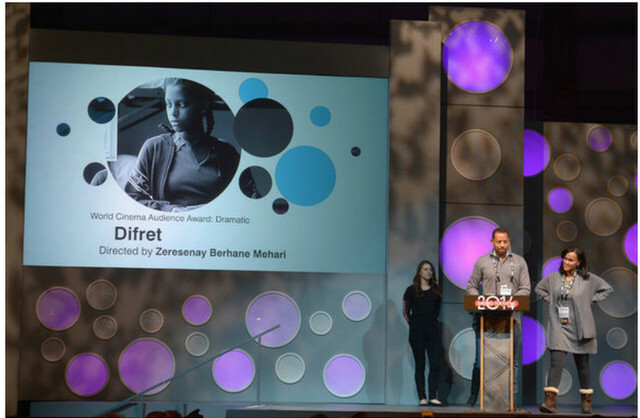 New York (TADIAS) — Last month Difret, an Ethiopian film directed by Zeresenay Berhane Mehari, won the World Cinema Dramatic Audience Award at the 2014 Sundance Film Festival. The film is currently premiering at the Berlin International Film Festival. Difret, which was initially funded through Kickstarter — an online crowdfunding platform — chronicles the true story of a teenager, from a rural village in the Arsi region, whose widely publicized arrest for murder in the 90s unleashed a historic court battle that resulted in the girl’s acquittal on the grounds of self-defense and legally ended the traditional practice of child marriage by abduction in Ethiopia. Below is an interview with the film’s Director, Zeresenay Mehari and Producer Mehret Mandefro. TADIAS: You had been developing the script for quite some time. What inspired you initially and what kept you going? ZM: When I found Meaza’s story I was completely enthralled. What she did to take on a legal system and entrenched tradition is truly inspiring to me. It is what pushed me to tell this particular story and what kept me going throughout. TADIAS: It was wonderful to see both female characters portrayed in such an honest and complex way without victimization. How did you go about casting for such demanding roles? ZM: The casting process took 8 months. The toughest role to find was that of the young girl. There aren’t many roles for child actors in Ethiopia so we had to go to the schools to try and find the young girl who would play Hirut. We printed out 6,000 flyers and went to all the elementary schools arranging transportation to and back from our audition studio. In the end, I finally found the girl I was looking for, Tizita Hagere. We heard that an old thespian was giving free acting workshops to kids at a local school. As luck would have it, the school was actually my old elementary school. And there in my old classroom was Tizita. I saw her and immediately knew she was Hirut. Meron Getnet was easier to find. She is a very established actress in Ethiopia and during the audition process she stood out from her peers immediately. She is a truly talented actress with a very bright future ahead of her. TADIAS: You were in the middle of the pre-production when the former PM Meles Zenawi passed away and the country was in a state of transition. Could you talk about some of the challenges that you had to face while shooting in Ethiopia, especially during that time? ZM: It was a sad time for the country and the mood was somber but thankfully it did not affect anything we were doing. The production moved along smoothly despite this great loss. TADIAS: Music is a big part of your film. The last song of the film, in particular, is very distinct. What led to your collaboration with David Schommer on the film? ZM: I love the last song. It’s actually an old recording of Aster Demoz (Leelai Demoz’s mother) that Dave remixed. We considered quite a few composers for this film. However, none of them knew Ethiopia like Dave did. In the end that’s why we went with him. He also happened to be a good friend so there was a relationship in place that could nurture the creative partnership. TADIAS: I love the fact that your crew is a mix of Ethiopians and non-Ethiopians. What was your process as a producer of the film? MM: Putting together our team was a cool part of the process. I joined Zeresenay first and we spent a lot of time talking about the people we wanted to involve in this project. Some of this was conscious but sometimes choices also came down to timing and what worked with everyone’s schedule. In the end, I am very proud of the team we assembled, which pulled talent from all over the world but was predominantly an Ethiopian team with a majority of women in lead creative positions. TADIAS: Speaking of your creative crew, Angelina Jolie recently joined you as an Executive Producer. In which ways did that help Difret? MM: Angelina joined our project during the post-production phase about 5 months ago. We had a locked picture when she saw the film and she really loved it and wanted to support us in getting it out there. Given her high profile, having her name attached definitely increases the visibility of our project and we are totally grateful to her for that. TADIAS: Congrats again on winning the World Cinema Dramatic Audience Award at Sundance. This was the first time an Ethiopian film was in competition at the film festival. How did that affect your career and perhaps even Ethiopian cinema? ZM: Thanks. It was truly awesome to win this award because when we first embarked on making this film so many people told us that there was no audience for a film like ours. Funders told us that the subject was too tough and would not lend itself to commercial distribution. The award obviously says otherwise and is truly a testament to sticking to something you believe in for the long haul. Given this is our first feature narrative endeavor it’s hard to say how this may affect our career – we are just beginning. But I do think winning the audience award at Sundance adds yet another layer of visibility to the film because distributors and others alike pay attention to who wins at Sundance. As for Ethiopian cinema, we are thrilled to be able to contribute to Ethiopia’s cultural history, and more importantly, hopeful there will be many more fantastic Ethiopian films competing at Sundance from here on. TADIAS: Difret is not only an exceptional film, but it also sends out a strong message. What are your hopes for Difret? ZM: My hope is that Difret starts a conversation about the parts of our tradition that hold women back. I think change takes time but it always begins with untold stories that compel us to think differently about what we take for granted. Telefa is a tradition that many still take for granted and I hope Difret can start a dialogue about perhaps letting go of this tradition once and for all.